Le président Bouteflika a voté jeudi 4 mai, assis sur son fauteuil roulant, accompagné de ses deux frères et de ses deux neveux. Hundreds of students marched in Algiers to protest Bouteflika's determination to seek a fifth presidential term in elections planned for 18 April. The AFP agency reported the students chanted "Bouteflika, there won't be a fifth term," to applause of onlookers. According to Reuters, hundreds more students protested in cities including Constantine, Annaba and Blida. Tens of thousands of people have been protesting against the president since 22 February in the largest public rallies the country has since the 2011 Arab Spring. 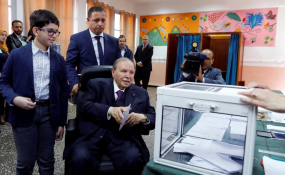 The latest round come after Bouteflika submitted his candidacy for re-election just before a midnight deadline on Sunday. Bouteflika has rarely been seen in public since suffering a stroke in 2013 and is currently in Switzerland for what his office calls "routine medical tests". He submitted his candidacy through his campaign manager, who read a letter in which the long-time leader promises to quit early if re-elected. Opposition parties on Monday called for the application of an article of the Constitution that would declare the presidency vacant in the event that poor health precludes the head of state from performing the presidential functions. They also called for elections to be postponed, for an "independent" government to organise a new ballot within six months, and for the eventual forming of an assembly charged with drafting a new Constitution.